Economists have puzzled over lacklustre wage growth, which has lagged in prior months despite the decline in the unemployment rate. Without higher wages, economists have warned that economic growth will be difficult to sustain, since consumer spending plays a large role in the US economy. The Labor Department report, released on Friday, showed average hourly earnings for private sector workers rose 9 cents in January, to $26.74. For the year, the increase was 75 cents. The wage uptick coincided with mandatory minimum pay increases in 18 states. Major employers such as Walmart have also said they planned to boost earnings or provide bonuses. Those factors may have helped lift last month's numbers, but they make it harder to say if the increases will continue, said Lindsey Piezga, chief economist for fixed income at Stifel, based in Chicago. "While that is encouraging, what we really need to see is sustained wage growth, not one-off, month-to-month volatility," she said. Other data in the report was a reminder that monthly gains can be fleeting. For example, the unemployment rate among black workers jumped in January to 7.7%, rising after falling to a record low of 6.8% in December. President Donald Trump had trumpeted that decline as evidence of economic improvement. The US is now in its ninth year of expansion and has been adding jobs steadily since 2010. The increases in January occurred across most industries, a sign of solid growth. The pace of hiring is slowing, however. Over the last three months, payrolls increased by an average of 192,000 jobs, compared to over 200,000 in the same period the prior year. "I don't think we should be too excited about this," said Ms Piezga. "The momentum of the US economy is waning. 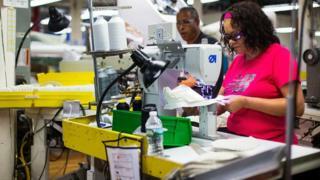 We're still talking about positive growth, positive job creation, but at a slower pace." Economists have said some slowdown in job creation is to be expected as new workers become harder to find. Despite a relatively high number of job openings, participation in the labour force has remained stuck below 63%, several percentage points lower than it was before the financial crisis. US stock indexes slid after the report. Analysts said part of the decline was due to investor reaction to the wage increase, which is likely to keep the Federal Reserve on track to raise interest rates - and could make policymakers move more aggressively. The Fed is one of several central banks that are turning from policies that were designed to boost economic activity in the aftermath of the financial crisis.